A new Ipsos-Reid/CTV News poll conducted earlier this week shows that the Liberals have taken a sizable lead in national voting intentions after a previously close three-way race in Ipsos's polling. As a result, the New Democrats have taken a step backwards. Kickstarter update: Funding for the project is well under way, with 21% of our goal having been reached after just two days. But we still have a long way to go, and the eBook on Canadian political public opinion polling in 2013 will not be funded unless the goal is reached! If the eBook interests you, and/or if you want to chip in to help with the operation of this site, please consider making a pledge. Just $10 will secure you an advanced copy of the eBook, and your name listed in the eBook as a thank you! I'll have an update next week on the eBook itself, including a chapter-by-chapter outline. 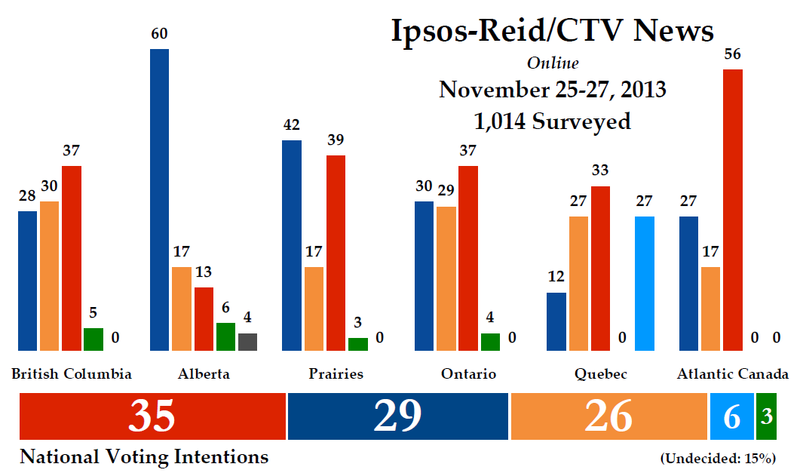 The full regional and demographic tables of the Ipsos-Reid/CTV News poll, also picked-up by The Globe and Mail as of writing, are available for everyone to see on the Ipsos-Reid website. Ipsos-Reid was last in the field at the end of October. There has been some movement since that poll, but only the drop in NDP support would appear to be statistically significant. The Liberals picked up four points to move in front with 35%, while the Conservatives dropped a single point to 29% and the New Democrats were down five points to 26%. Of note is that the Tories have dropped in three consecutive polls from Ipsos going back to September, when the party was at 32%. The Bloc Québécois was unchanged at 6%, while the Greens were up one point to 3%. About 15% of the sample was undecided. The Liberals led among both men and women, by two points over the Tories among men and by 10 points over the New Democrats among women. The New Democrats led among voters under 35, the Conservatives among voters over 55, and the Liberals among the rest. This puts the Liberals back where they were a month after Justin Trudeau became leader, when Ipsos-Reid had the party at 36% and ahead of the Tories by six points. Regionally, the Liberals were in front with 37% in Ontario while the Conservatives were down to 30%. They have dropped in three consecutive Ipsos polls, from 37% in September. The NDP was down to 29% support in the province. In Quebec, the Liberals were up to 33% while the New Democrats and Bloc Québécois were tied for second at 27% apiece. The Conservatives were steady at 12% support. The Liberals led in British Columbia with 37%, followed by the NDP at 30% and the Conservatives at 28% (down in three consecutive polls from 38% in September). The Greens were at 5% in B.C. In Alberta, the Conservatives were ahead with 60% to 17% for the NDP and 13% for the Liberals. This was the only part of the country where the Liberals did not place first or second, and marks two consecutive polls of decreasing support. The party was at 26% in Alberta in mid-October. At 6%, the Greens had their best regional result here. The numbers hardly budged in Atlantic Canada, with the Liberals at 56%, the Conservatives at 27%, and the NDP at 17%. The Tories have picked up support in two consecutive polls in the region, after being at 16% in mid-October. And in the Prairies, scene of the dramatic by-election gains for the Liberals on Monday, the party was up to 39%, putting them just behind the Conservatives at 42%. The NDP dropped to 17% support. At these kinds of support levels, the Liberals would likely eke out a plurality of seats with around 126. The Conservatives would likely take around 121, leaving the NDP with 60 seats. The Bloc Québécois would come up the middle and take 30 seats in Quebec, with the Greens retaining their one. That a six-point national lead is not enough to give them a plurality of even six seats shows that the Liberal vote is not as high as it needs to be in certain parts of the country. Though they put up good numbers in the Prairies and British Columbia, the Conservatives still win 63% of the seats in the four western provinces. Alberta is a virtual sweep, as at only 13% the Liberals are unlikely to make a breakthrough in Calgary or Edmonton. They are not far enough ahead in Ontario to win the 70 seats or so the Tories were able to manage in 2011, and the race is too close in Quebec for the party to pull off the kind of landslide the New Democrats did in the last election. The good news for the Liberals, though, is that it wouldn't take a lot of movement to put them in a much stronger positions seat-wise, particularly in Ontario and Quebec. These Ipsos-Reid/CTV News polls are often released in stages, so we should have some interesting leadership numbers to chew on in the coming days. In particular, I'll be looking to see where Thomas Mulcair's numbers go. He has been getting praise in the polls as well as in the press gallery for his performance in Question Period. Though few Canadians watch it, they probably do see the clips on the news. It had seemed that he and his party were getting a boost, but now it would appear that the Liberals are benefiting from the discomfiture of the Prime Minister. Thankless work for the opposition leader. The poll having been conducted from Nov 25-27, I wonder how much of the switching from NDP to LPC is attributable to the immediate aftermath of the by-elections having dominated the media on Nov 26-27 with a deluge of headlines declaring the Liberals the big winners. There definitely seem to be a lot of voters on the fence between the Liberals and NDP right now. The CPC on the other hand has been pretty much reduced to its base for some time now, so any further bad press for them probably won't drive their numbers down much more, perhaps only reinforce the voters who've already deserted the them. Mulcair a semé la dévastation dans le camp conservateur, mais c’est Trudeau fils qui a récolté, au Québec, en Ontario et dans les Prairies. La déroute est annoncée. En oubliant sa principale base électorale, le NPD n’aura rien gagné au Canada et il perdra le Québec. Just a comment on a simple smell test. The Liberals to go from 2 seats to 8 in the prairies? Hasn't this just has been proven wrong by a poll with a sample size of 27,000 with the Cons just holding Brandon Souris. If the Liberal's can't win this seat in a by-election in full protest mode with a concentrated effort running a iconic Conservative name (some of the people voting likely voted for Dinsdale thinking they were voting Cons) with 3 visits by the leader what possible gains will the Liberals make in the prairies? I don't think the poll is wrong. It is likely accurate if you give it a plus or minus of 30%. Namely, the Liberals can make gains in Manitoba ridings where they did better than 5% (i.e., not Brandon-Souris). It seems unreasonable to call B-S a riding they should have won, since it is one of the least likely ridings they should win in Manitoba (or anywhere in Canada), based on their support from 2011. Are you seriously suggesting that Brandon Souris was somehow representative of the Praries? This riding was a prospective poster child for Hopeless riding for Liberals. The fact that they came so close to winning, when 10 weeks ago it is doubtful they could muster 100 volunteers shuld tell you a lot, and what it tells you is the opposite of what you think it is telling you. I agree Eric. The local issues that were at play in Brandon-Souris were temporary and it's likely this riding will return to solid Tory for another generation. What is interesting about the riding, though, is this past by-election shows a real split between the urban vote (Brandon) and the surrounding rural vote. Dinsdale and the Liberals cleaned up in Brandon but lost every poll but two in the rural areas of the riding. yet another negative result from our antiquated first-past-the-post electoral system. Such disregard for a large number of votes and segment of the population cannot be good for any democracy. Where Liberals certainly have a chance in Manitoba is in Winnipeg. A few Tories are there by very few votes. It wouldn't take much of a swing (NDP voter to Liberal) to see a change to Liberal red in Winnipeg. Will the NDP numbers be going up in the Canada aggregate now because of the 26% in the Ipsos-Reid poll? That is higher than the 23% they are at right now. One would imagine. I haven't updated yet. The Ipsos poll showing the prairies overall does look very interesting for the liberals. In winnipeg that leaves winnipeg south, wininpeg south centre and St. boniface ridings likely winable. The newly created urban sask ridings (I am at a loss for their names) could also be potentially winable for the liberals at this level of overall support. I suspect provencher is more reflective of liberal vote increase in rural ridings but it will take a full election to see what the urban change is really like. I think you might be right about Provencher. Even the Liberal candidate was the same one from 2011. Bloc seat prediction is overblown. Daniel Paillé is an unknown and Quebecers rarely vote for a party lead by someone who is not well known locally. The guy lost his seat to an NDP lamppost in 2011 for crying out loud. Yes, I think more than a few NDP incumbents would survive even with the BQ at 27%. Let's all take a deep breath and back off for a little while!! Way to close to the by-elections right now. Wait a month ?? If the Bloc were the elect 30 MPs that would be extraordinary news. I am not a NDP supporter (I will likely vote Liberal in the next federal election). But I am amazed how the media is portraying that the NDP is struggling in the polls and did not do well in the by-elections. On the contrary, I think the NDP is actually doing well in current circumstances. They are holding their own against the resurgent Liberals. In fact, I think they are on a slight uptick. They were polling on average in the low 20s a few months ago. Now they are polling in the mid-high 20s. The Tories are at 29 and the NDP is at 26, that is not bad place to stand for a party who has never held power and that has been through a lot in the last two years. The NDP held 2011-level support in Toronto Centre and Bourassa. While their vote share did drop in the two Manitoba ridings, they weren't that high to begin with. Similar situation occurred last year in Calgary Centre. I wonder if some people will remember the by-election in Vaughan in Fall 2010 where the NDP only got 1% of the vote. Ignatieff then spinning at the "blue door and red door" are the only options. We all know what happened a few months after that. Do I think Mulcair will be PM in 2015? Unlikely. Only if Harper is still unpopular and Trudeau really screws up. And even then the NDP has other obstacles. But at the same time I doubt his party will be relegated to a distant third place either. Like an earlier poster said Daniel Paille is a nobody, the BQ will not be a threat. The NDP will lose some seats to the Liberals in Quebec and Atlantic Canada, but I think people will be surprised how many of these incumbents will survive. Riding redistribution will work their favour in urban Saskatchewan and downtown Toronto. 2015 will be truly a three party race. Three parties. Three bases. Three ideologies. I agree. Mulcair has built a solid, committed, idealistic energetic base across Quebec that is not going away; the Bloc used to draw people like this. The other parties are pretty much depending on old allegiances as their support base. Montreal-Nord is a testament to the old-style politics of Denis Coderre and the Chretien Liberals that courts immigrant communities with pork-barrel politics. Trudeau is different of course, and appeals to the more idealistic activists, but I think Mulcair is way ahead in courting and building this base. It will take a high profile election campaign to see which leader can handle the inevitable gaffes from rookie candidates and enforce party discipline. My money would be on Mulcair over Trudeau here, just because of experience and a longer time building a base. Funny but practically no one had ever heard of Gilles Duceppe when he became leader. And he held it together quite nicely through several election cycles. In short, nothing can be ruled out entirely. And now there is a new poll out that says the Libs lead by 10 points ! Eric? Most of the results look pretty much as expected but this one. 5 points ahead in Man and Sask !! Wow !! And 11 points in Que, Sorry Tom !! Yeah, that poll actually has the Bloc 4 points ahead of the NDP in Quebec. Pretty remarkable. Eric is it my imagination or is this more evidence of a "trend line" going back before the Senate scandal and just enhanced by that scandal ?? That trend line started before Justin was selected as leader. That's when the Conservatives started to dip and they have been going steadily down -- bit by bit -- ever since. I think Ron the point I was trying to make was that sure, right after the convention there was a big spike for Justin & The Liberals but we all expected that to dissipate fairly quickly and we would be back to pre-convention. But that didn't happen, to my surprise as much as anybody. And that line has, as you say, been slowly rising until the Senate scandal came along. Now it seems almost out of control. Watching this will be fun ! !